Transplanting turf into your garden is great way to produce a healthy, vibrant lawn around which your borders, trees, beds or allotment can grow. A beautiful lawn is the centrepiece of any garden: but laying turf is a prospect many gardeners regard with dread. Do this before your new turf arrives. 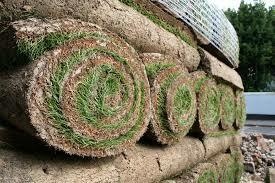 You want to make sure you can lay your new turf quickly to minimise the amount of time your replacement rolls are sat decomposing in the open air. Your rolls will be alive, naturally, however being dug up and moved isn’t a healthy experience for them so you should aim to keep their time away from the soil as limited as possible. Begin by clearing a space for your old turf: you don’t want to realise you have to move it while your fresh new replacement is drying up (or worse, sat in the rain) on your driveway. If you have space your old turf can become fantastic compost- loam, a very useful and hugely fertile source of nutrients for your plants. It does, however, take over 2 years to fully rot down, so expect to have to prepare a dedicated, semi-permanent compost bin to accommodate it during this period, rather than simply dumping it on top of your other compost. Use a knife to cut lines into your turf, then gently prize it up with a spade. Try and remove the old turf as cleanly as you can. After this you should take the opportunity to improve your soil slightly- screen, rake, roll and finally fertilise your soil so your new grass gets the best possible start. Taking out any lumps or rocks in the soil can help your new lawn lay down roots faster, while tilling and breaking up the soil will help improve drainage. Use good compost or fertiliser to boost the nutrition your new turf receives and give it a bit of boost to overcome the difficulties establishing itself in a new place. Once you’ve done this, you’re ready to lay your new turf. This should be done as soon as possible- every minute your rolls of turf sit there their condition worsens, and your new lawn will struggle a little more. Mark out the position for each roll with string, so you can clearly see exactly where it needs to go, and carefully unroll each one so it sits evenly and plumb with other segments. Once you've finished laying turf, use a roller to press it gently into the soil, to ensure no air remains between it and the soil. Once you’re satisfied with the appearance of your rolls, water them regularly and keep it well fed for several weeks. Once your lawn is established you can slow down your regular watering, dependant on the weather. Visit our shop today or speak to one of our team to discover more about how we can help you uncover your garden’s potential.